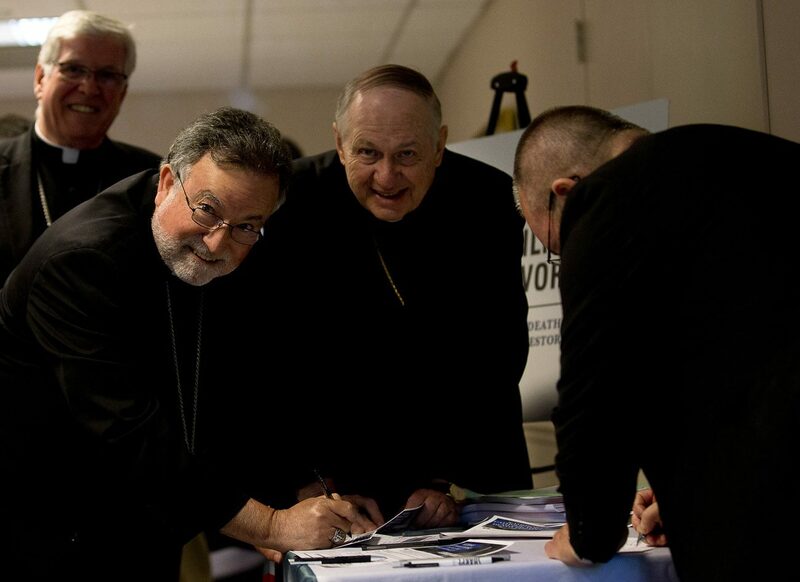 WASHINGTON (CNS) — Bishops attending a meeting were among the first to sign the National Catholic Pledge to End the Death Penalty at the U.S. bishops’ headquarters building May 9. Each person taking the pledge promises to educate, advocate and pray for an end to capital punishment. “All Christians and people of goodwill are thus called today to fight not only for the abolition of the death penalty, whether legal or illegal, and in all its forms, but also in order to improve prison conditions, with respect for the human dignity of the people deprived of their freedom,” Pope Francis has said. This quotation kicks off the pledge. The pledge drive is organized by the Catholic Mobilizing Network. “The death penalty represents a failure of our society to fulfill the demands of human dignity, as evidenced by the 159 people and counting who have been exonerated due to their innocence since 1973,” the organization says on the pledge sheet following space for someone’s signature. The idea for the pledge campaign took root in January, said Catholic Mobilizing Network executive director Karen Clifton in an interview with Catholic News Service. It is supported in part by a $50,000 grant from the U.S. bishops’ Catholic Communication Campaign. Clifton said Arkansas’ bid to execute eight death-row prisoners in a 10-day span in April — four were ultimately put to death — “exacerbated the situation and showed it as a very live example of who we are executing and the reasons why the system is so broken,” she said. Penalties for crime are “supposed to be retributive, but also restorative. The death penalty is definitely not restorative,” Clifton said. Those on death row are not the worst of the worst, they’re the least — the marginalized, the poor, those with improper (legal) counsel,” she added. Bishop Frank J. Dewane of Venice, Florida, chairman of the U.S. bishops’ Committee on Domestic Justice and Human Development, said he and his fellow bishops have voiced their views strongly with Gov. Rick Scott of Florida, where capital punishment is legal and where prisoners have been executed. Bishop Jaime Soto of Sacramento, California, who was one of a number of bishops who signed the pledge following a daylong meeting May 9 at the U.S. bishops’ headquarters building in Washington, said the church’s ministry to prisoners is another source of hope. “It’s the ministry of companionship that’s so important,” he noted. Capuchin Father John Pavlik, president of the Conference of Major Superiors of Men, told CNS that networking is a key tool in the toolbox in spreading information opposing the death penalty. CMSM, he said, has a person on staff to monitor issues surrounding justice and peace, and has consistently communicated capital punishment information to CMSM members.